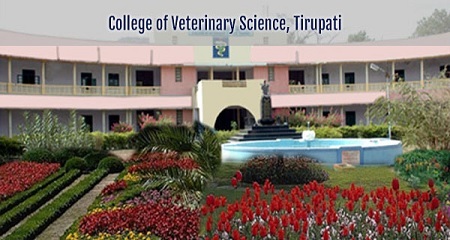 College Of Veterinary Science Tirupati is one of the reputed Government Veterinary Colleges in Tirupati. The college was founded in the year 1955. This famous Tirupati Veterinary College is affiliated to The Sri Venkateswara Veterinary University, Tirupati and is approved by Veterinary Council of India (VCI). In this article, we will provide you with the detailed information about College Of Veterinary Science Tirupati Fees Structure, Course offered, Admission Procedure, Placement Stats, Cut-off, Facilities available and complete college review. Educational Qualification Students who have passed 10+2 in the field of Physics, Chemistry and Biology are eligible for this course. Note: The Counseling for admission to 15% All India Quota seats shall be conducted by a Veterinary Council of India and the decision of VCI shall be final. ** Fee charged at the time of admission are subject to change. It is one of the premier Veterinary Science Institute in Tirupati. We would like to give 3.8 out of 5 stars on Edufever Best Veterinary Colleges in Andhra Pradesh.